Have you seen the summer zombie flick World War Z? As writers, you may know that the movie is based on the book of the same name. You may also know that the author, Max Brooks, spent a few seasons writing for Saturday Night Live and is the son of Mel Brooks. That’s right, the Spaceballs guy. Interesting trivia, but I don’t think I’ll see this movie in the theater because I’m not a huge fan of zombies. And I have my hands full right now with World War W: The Puppy Apocalypse. Walter, the W in question and newest member of our family, is a terrier-mix puppy who found his way to us via a rescue organization. He is adorable and a pretty good little guy, but very active. He wakes up every morning raring to go, full of whatever methamphetamine-like substance a puppy’s body produces during the night. Though his disposition is sweeter than a zombie’s, he is smarter, quicker, and his teeth are sharper. And I’m pretty sure he shares the taste for human flesh. 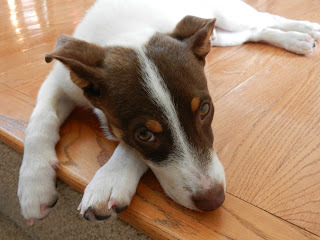 Many hours of my day are now devoted to a complicated strategy of puppy distraction, diversion, and redirection. It probably goes without saying that my house also looks like an exploded PetSmart clearance bin. All this puppy energy can be overwhelming for the old dog…and for me. (Fess up: you thought I was the old dog, didn’t you?) But nature has endowed busy puppies with a very important survival skill: the nap. Which brings me (finally!) to the point of this post: my renewed appreciation for quiet moments in which to write. Pre-Walter, I had many of those moments, especially during the school year. But my time-management skills are notoriously soft. If you need someone to kill time, lose track of time, spend it, pass it, or while it away, I’m your gal. I have discovered in recent days, however, that when I know a crazed puppy might be chewing on my ankles at any moment, I’m more focused, more efficient, and—dare I say—even a bit more productive. For five whole minutes at a time. But it's a start. What helps you make the most of your quiet moments for writing? Katie Cat sounds almost as bad as your W. To get my attention these days, she dumps over the shredder and distributes the shreds all over my office. Wicked little beast. The only real quiet I get is when my hubby is out of the house. It's hard to choose whether to write or just enjoy the quiet by taking a nap. Sometimes the nap wins.